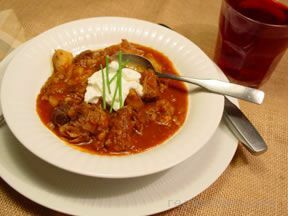 "I added a couple of cloves of garlic along with the chopped onions which went ... read full review"
Using half the flour (3/4 cup) coat the pieces of rabbit, shaking off any excess. Heat the oil and butter in a large heavy-bottomed saucepan, and brown the floured rabbit on all sides. Add the celery, carrots, onions, salt, pepper, bay leaves, 6 cups water and red wine, and stew for about 2 hours. Add the potatoes 45 minutes into the stewing process. Once the rabbit and all the vegetables are cooked, use some water to form a paste with the remaining 3/4 cup flour. Stir the flour mixture into the pot as a thickener. Add the already sautéed mushrooms to the stew and allow to simmer for about 10 minutes. Adjust seasonings, if necessary, and serve. 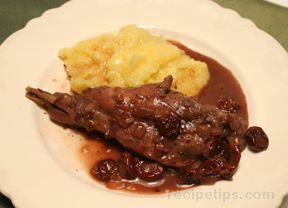 "I added a couple of cloves of garlic along with the chopped onions which went down well. 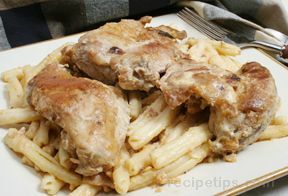 This is a very easy dish which, aside from having to fry off the mushrooms towards the end, is almost a "one pot" meal. It's easy, tasty and cheap! Rabbit being a much under-used meat in this country."